Apache ODE (Orchestration Director Engine) can be deployed and run in three different environments. One of them is deploying ODE as a web service in Axis 2, by deploying the ode war distribution inside an application server like Apache tomcat. Once it is deployed and started you may need to debug ODE, to understand what is going inside the engine. The following is a short guide on how to debug Apache ODE with tomcat in both Windows and Linux environments. If you don't know how to deploy ODE and run with Apache tomcat first visit and read the this previous blog post. Apache Tomcat can be debugged with JPDA debugger by starting tomcat with catalina script. To do this start go to Tomcat_Home/bin folder and enter the following command. This will start catalina server in debug mode and you can see it displays the message, "Listening for transport dt_socket at address: 8000" in terminal as shown in Figure 1. When it is set start the catalina server in the usual manner as 'sh catalina.sh run' and tomcat will be started in debug mode. Now we can create a remote debug configuration by giving Host: localhost and Port: 8000 in our IDE which we have used to open the ode source code, and debug ODE by using that. Remember to use the same port used as JPDA_ADDRESS in tomcat as your IDE's remote debug port. The default port address is 8000. 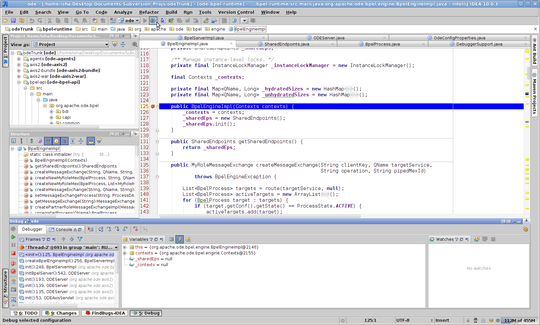 This is how to create a remote debug with IntelliJ Idea 10. When it is selected the Run/Debug Configuration window will pop up. 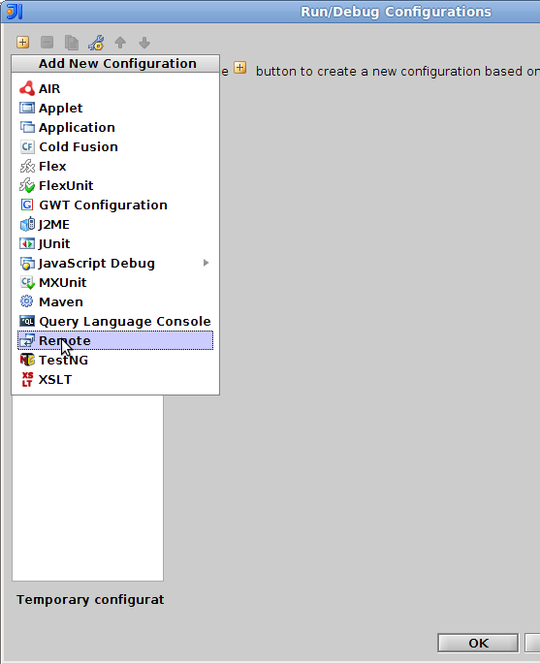 Click the icon there and select 'remote' from 'Add New configuration' menu. This will create a new remote debug configuration for us. Let's name it as 'ode' and fill the Host field with 'localhost' and Port field with '8000'. Then click OK. The new remote debug is successfully created now. After the tomcat server is started, select 'ode' remote debug and start it by clicking icon in Idea. It will connect to the server via the defined port and you can start debug ODE now. Note: port 8000 is the default port address used in tomcat for JPDA debugging, however if port 8000 is busy(due to some other application running there), you can change it into another port. Open catalina.sh script in the Tomcat_Home/bin folder and search for JPDA_ADDRESS, you will see JPDA_ADDRESS="8000" defined there. Change it to any available port and restart tomcat under JPDA debugger. The server will listen from the new address now. apache-tomcat-7/bin$ export JPDA_ADDRESS=8010 in terminal. Now go back to the 'ode' remote debug and select 'Edit Configurations' to edit its configurations. 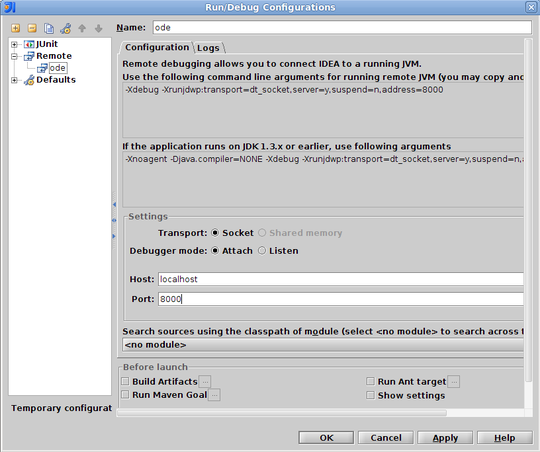 When Debug Configuration window appears set the Port address into the modified port,8010. Once it is set ODE can be debugged using the new port again. Debugging in Windows is also very similar to in Linux, except the commands that should be used. All the following demonstrations are performed in Windows 7 version. To start tomcat, go to the tomcat home's bin folder and start catalina.bat file under jpda debugger as follows. 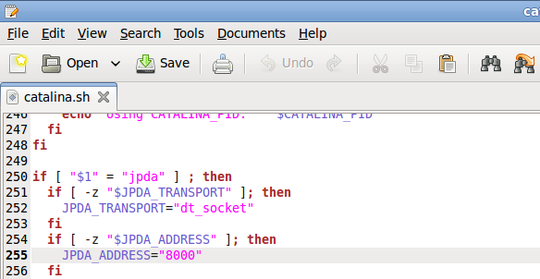 Now catalina will start in remote debugging mode under JPDA debugger using its default port 8000. 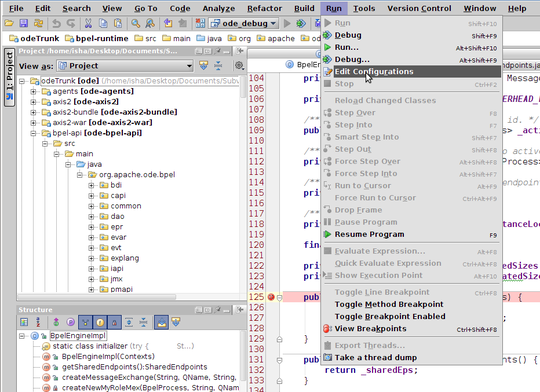 When it is started you will see tomcat starts a new debug console as shown below in Figure 8. This can be also done by setting an environment variable JAVA_OPTS, and starting the tomcat server with usual command. When it is started create a new remote debug configuration as described in the previous section by configuring the correct Port address and Host. Once the remote debug configuration is connected to the server, you can debug ODE successfully. When tomcat is started again you will see that it has changed the listening port into '8010' as we changed. Change the Port address in the remote debug into this new address and start debugging again. JPDA_ADDRESS can be also changed from the catalina.bat file in Windows. Right click catalina.bat file and select 'Edit' option from the menu. Then the file will be opened using Notepad or some other text document opening application in Windows. Search for JPDA_ADDRESS and change its value into a new one. Save the file back and start tomcat again. Error running ode: Unable to open debugger port : java.net.ConnectException "Connection refused: connect"
19:53:27,314 WARN [ODEAxisOperationDispatcher] No operation has been found! "Error running ode: Unable to open debugger port : java.net.ConnectException "Connection refused: connect" message usually occurs when you haven't started your tomcat server before debugging it with Idea. Make sure you have started tomcat in debug mode first and then start the remote debug.Can you check what is the console output when you gives the 'catalina.bat jpda start' command? 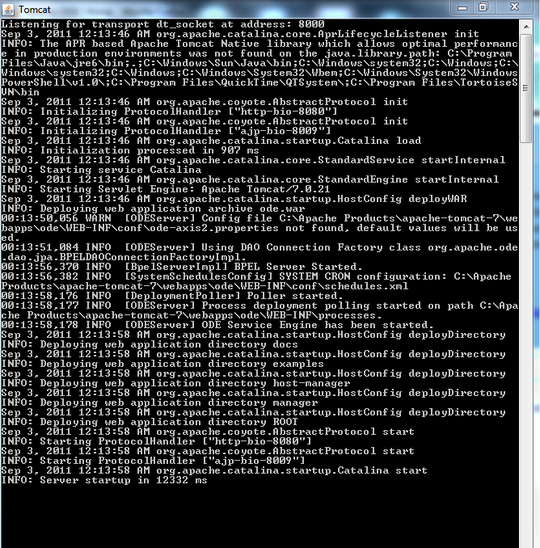 About the second part i think you got this error log when trying to run the sample HelloWorld process. In that case you need to call the operation which is rendered in your HelloWorld Service when running the process from your web browser. Therefore your input URL in the browser should be like this. Try this in your browser after starting ODE and you will see the response. The following thread has a good explanation on this. thanks you very very much for your step by step explanation. It worked really well following your steps. I got this error when I am running. How to fix it? ERROR: Cannot load this JVM TI agent twice, check your java command line for duplicate jdwp options.